The leader of the National Woman's Party, Alice Paul, staged a hunger strike in jail after her arrest. Prison doctors had to force-feed her and others. 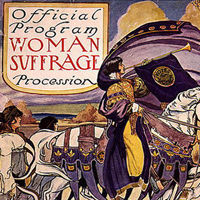 With all the pressure from publicity generated by the White House pickets, the arrests and forced-feedings of women protestors, President Wilson finally lent his support to the suffrage amendment in January 1918. Congress approved it, and on August 18, 1920, with the ratification of the Nineteenth Amendment, women achieved the right to vote. That date is now commemorated as Women's Equality Day.